Description: Experience the phenomenally successful series, All Creatures Great and Small, based on the best-selling books by James Herriot. Set in the fictional Yorkshire Dales town of Darrowby, the series offers comforting reflections of a much gentler time when life moved at a somewhat slower pace. This collection features every episode, tracing the endearing career of this country veterinarian, from the 1930’s through World War II and the hopeful 1950s. It’s a joyful journey that will warm the hearts of fans everywhere. 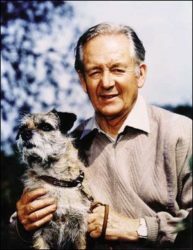 Description: James Herriot is a vet in Yorkshire, England, during the 1940’s. He is assigned to the practice of Siegfried Farnon, who (together with his mischievous brother Tristan) already have a successful business. James undergoes a variety of adventures during his work, which are just as often caused by the characters of the county (including the Farnon brothers) as the animals in his care. Description: All Creatures Great and Small Series Five continues the heart-warming tales of James Herriot (Christopher Timothy), his wife Helen (Lynda Bellingham) and his volatile but warm-hearted partner, Siegfried Farnon (Robert Hardy). The period is now the early Fifties, but the Dales are slow to embrace the world of tomorrow. Description: 1983 SPECIAL: James returns to Darrowby following his wartime service in the R.A.F. 1985 SPECIAL: Siegfried waxes lyrical about the accelerating rate of scientific progress as James proceeds to plod along with tried and trusted remedies. Description: The story of the young vet travelling to Thirsk (a.k.a. Darrowby) was immortalized in Herriot’s bestselling books. But The Real James Herriot , Jim Wight’s affectionate biography of his father, tells the story of the man behind the nom de plume, who worked in the same practice for over 50 years and was relatively untouched and unimpressed by his fame as an author. Mrs. Pumphrey’s inimitable Pekinese, Tricki Woo. Description: Eight years after James Herriot’s Dog Stories, the grand old British veterinarian and raconteur has compiled a similar but much shorter collection, in small gift-book format, of his favorite cat tales. Description: In this sequel to his 1994 Favorite Cat Stories, the estwhile veterinarian spins more loving yarns of the animal world; this time, though, the heartwarming tales are about dogs, and dog lovers will certainly be satisfied. nursed back to health on a nearby farm. make a wonderful gift for all readers, great and small. own–running away, only to turn up in the funniest places. local policeman saves the day. sending blossom to market. At least, that’s what he and the vet thought. special day on the town. stories, and it is sure to be one of yours. a young age. The two are reunited later-with a surprising response from Gyp. Description: In 38 moving chapters, Herriot once again captures the magical beauty of the Yorkshire dales, the joys and sorrows of its inhabitants, and the richly rewarding experiences of a country veterinarian. Description: Takes readers on a delightful walking tour of the land he brought to life in his memoirs. Glorious color photography is supplemented by Herriot’s own irresistable descriptions. Description: In the midst of WW II, James is training for the Royal Air Force, while going home to Yorkshire whenever possible to see his very pregnant wife, Helen. Musing on past adventures through the dales, visiting with old friends, and introducing scores of new and amusing characters–animal and human alike–Herriot enthralls readers once again with his uncanny ability to spin a most engaging and heartfelt yarn. Description: Young James, now married and working as a small-town vet, encounters a cast of extraordinary characters as he makes his way through the Yorkshire countryside tending to sick cattle, pregnant ewes, ailing dogs–and their eccentric owners. As always, Herriot’s warmth, humor, and singular view of life makes readers laugh and cry, as they marvel at the everyday miracles he creates. Description: This television film based on the autobiographical novels of country veterinarian James Herriot predates the popular British TV series of the same name by several years. Shot on location in the picturesque Yorkshire countryside, it is utterly charming and features quite an illustrious cast. Academy Award-winning actor Sir Anthony Hopkins is terrific as the dedicated, exasperating Dr. Siegfried Farnon, who takes young Herriot, fresh out of a London veterinary college, on as his assistant. Herriot is appealingly played by Simon Ward (perhaps best known as the Duke of Buckingham in The Three Musketeers). Description: Here is the heartwarming true story of Dr. James Herriot, an English country veterinarian, whose humor and natural storytelling ability have captured the hearts of American readers in a very special way.